home Hardware Is it Harmful to use a Hot MacBook on your Lap? With laptops becoming increasingly more common than desktop computers these days, and the popular MacBook line getting ever-more powerful with each refresh, the issue of overheating is a significant one. 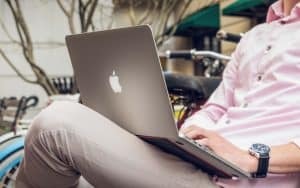 In addition to causing hardware failures within the computer (as explained in this article) the heat generated by your MacBook can cause you discomfort and can even be a danger to your health – The latter of which this article will focus on. Note that if your Mac is experiencing poor battery life in addition to overheating, you should also check out this page. Many people believe that because laptops are complex electrical devices, they emit radiation that can prove harmful if one is exposed to it for too long. Research into wether high cellphone usage causes cancer has been highly publicized, and experts warn cellphone users not to talk on their phones for extended periods of time when not necessary. So does the same apply for laptops? Cellphones are believed to be harmful to people because they emit a large amount of radiation when sending and receiving signals – Calling being worse than texting or using the mobile internet, as when you’re calling you’re generally holding the phone up to your ear, exposing your head to the radiation produced by the signal of the phone call. However even having your cellphone on standby in your pocket is believed by some experts to be harmful, as it is constantly connected to the cellular network, and is therefore emitting radiation. But MacBooks are not connected to the cellular network. Sure, there’s the WiFi signals – However they are much weaker, and therefore much more harmless, than cellular signals, in the same way that the short range signal used in wireless landline phones are weak & harmless. Cellular signals need to make it from a tower dozens of miles away to your phone, whereas WiFi signals only need to make it a few metres to your MacBook. So it is a pretty safe assumption to say that you don’t need to worry about the radiation your MacBook produces via it’s wireless activity. So what about screen radiation? Screen radiation is another supposed health hazard that many people are wary of when it comes to using laptops for long periods of time. However, while it used to be a relevant hazard 10 to 15 years ago, the danger of screen radiation when it comes to computers holds little relevance today. 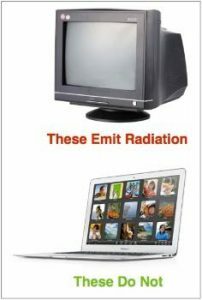 When it comes to screens, the only type that emits enough radiation to be harmful is the CRT display – For those of you who don’t know, CRT displays are those old, bulky “tube” monitors that were the dominant type of screen in the late 90s and early 2000s. And since the computer industry doesn’t use CRT screens anymore (and the laptop industry never has) screen radiation is more or less irrelevant. LCD displays (the modern, flatscreen type used in laptops) do emit a little radiation, however it’s such a small amount that it’s pretty much negligible. The thing makes using a hot MacBook on your lap harmful is not any sort of radiation – It’s simply the heat it generates. If someone’s genital area is constantly exposed to heat, a number of health problems can arise, including, but not limited to, fungal infections, infertility and even genital cancer. So what sort of heats are dangerous? As in, how hot does your MacBook have to be to be a hazard to your health? Well, that depends on a few things, such as the ambient temperature, how long you’ve been using the MacBook on your lap for and the clothing you’re wearing. During the winter, as long as your house isn’t heated to an excessive level, your MacBook’s heat will only be a problem if it seriously overheats – As in, 90-100C (by the way, to check your MacBook’s temp, download SMC Fan Control here). And those type of high heats should only occur when you’re doing intensive things on your Mac, such as gaming, video editing etc. However the summer is a lot more dangerous. Unless you’re using your MacBook in a heavily air-conditioned room, heats as low as 70-80C (which can be reached by preforming fairly normal tasks, such as watching videos) can cause the bottom of your MacBook to get very hot – Especially if you use it for long periods of time. Exposing your genital area to lots of heat for long periods of time will eventually cause infertility in men, and in both genders can cause nasty fungal infections that are difficult to get rid of. 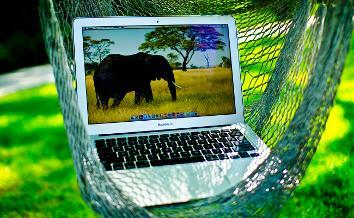 It is therefore very important that you protect yourself from your MacBook’s heat, especially during the summer months. You can protect yourself from the heat your MacBook generates by simply placing something in-between your MacBook and your lap. Things like cushions and pillows will protect you, as will blankets and rugs. However while these things will protect you from heat, they also act as insulation to your Mac, causing it to heat up even more. This is bad for your MacBook’s long term health, as overheating slowly fries the CPU and GPU (You can read more about the effects of overheating on your Mac in this article and this article). So what should you use instead of cushions or pillows? Hard objects, as they allow your MacBook to “breathe”, promoting good airflow, which effectively cools it down. Things like large hardcover books (encyclopedias, atlases, etc) will suffice, however they aren’t the most comfortable things to have on your lap for long periods of time. A more comfortable option is a “lap desk”. A lap desk is what the lady in the photo above is using, and is a product designed specifically to provide a nice comfy “cushiony” surface to rest on your lap, while providing a hard, flat desk-like surface for your laptop to rest on — this ensures that both that you are comfortable and your MacBook has good airflow. If you’re interesting in getting a lap desk, check out the products below. If you want to go one step up from a lap desk, you could consider a laptop cooling pad to both cool your Mac down and make you more comfortable. A laptop cooling pad is similar to a lap desk, however it takes the concept one step further by including fans that draw hot the air away from the computer, aiding in keeping you and the laptop cool. Most laptop cooling pads are powered by one of your MacBook’s USB ports, and some even include a USB hub in the body of the pad, so that your Mac’s scarce ports aren’t wasted. Laptop cooling pads are generally only required by heavier users, who use their MacBook to preform intensive tasks on a regular basis – So if you’re finding that yours is getting hot quite regularly it might pay to get a cooling pad (A few good ones are the Belkin F5L001 and the Targus Lap Chill Mat) However if not, you probably don’t need one.